UPDATED: Verizon pulls the Samsung Glyde from the shelves? 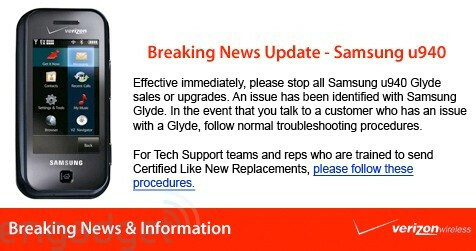 EngadgetMobile is reporting that a Verizon Customer Call Center has received information about the Samsung Glyde being pulled from store shelves. The "issue", as its worded, is not defined, but makes us wonder if it has to do with the problems related to the touch-screen. If you are experiencing problems with your Glyde, or it is currently in for service, they will exchange it for an enV2, or another similar-priced phone at the managers discretion. However, one employee in the know reported on HowardForums that this is only related to the Mid-West market, saying that it was a switching issue between some Glydes and switching equipment used in the Midwest. *UPDATE* We received word from Samsung PR stating that, according to them, the Glyde is still for sale in all areas of the US. However, in contradiction, our Verizon insider (VZW E) said that he was told by Quality Assurance "the Glyde was not pulled for switching problems after all it was pulled strictly as an executive decision due to its high return rates and complaints from customers." Keep in mind that each region has their own executives to decide which devices to stop selling if there are customer complaints. they have known since it came out it doesnt work correctly...Verizon can't seem to here us. I have a glyde and I am going to return it today .. its a piece of crap. But, I'm not getting an enV2, I'm complaining until I get a touch screen device. unless you live in the midwest, they arenvt going to swap it. They are not swapping because the touch-screen issue, it is because the way it is communicating with the towers. Regardless of why they are replacing it, if you purchased a touch screen device, shouldn't you be able to get a working touch screen handset if yours needs to be replaced? PA is part of VZW's Midwest Market. Western PA is part of the mid-west market and Eastern PA is part of the Northeast market. Arent u special...thank for that essay you dweeb! Dweeb? Is it 1988 again and no one told me? Anyway in response to number 31, thanks for your story. I actually do live in the midwest market and I was able to get an LG Voyager as a comparable device replacement. They were trying to shove the enV2 on me but I complained enough until they gave me a Voyager. I purchased the Glyde for its touch screen, I wasn't going to just downgrade to a regular TXT device. Oh, Im the OP (#3) by the way. So yeah .. it worked out for me. I live in Maryland, and I bought a Glyde in June, only to take it back and get a "software upgrade" in September because the screen functionality was so bad. This of course did nothing so I had them replace the phone within the week, only to have the new one be just as bad as my old right out of the box. I called Verizon and yelled at them long enough that they gave my a Blackberry Curve. I told them this was the only way I would be happy with my service at this point. Express your displeasure enough and they'll give you almost anything. Don't count on the Storm however, that thing is prob going to be backordered a couple of weeks after its comes out and their is no way they'll allow it as a replacement device. i wouldnt complain too much because they are starting to get more picky with giving discounts and exchanging phones that arnt considered replacement devices. Here in the Northeast Area. Washington Baltimore, Virginia. you can yell and scream all you want but your gonna end up with the phones replacement device. we're not gonna put you into a curve because you were dumb enough to pick a piece of crap phone. apparenty you know this site exists so maybe you should do some research before you buy your next phone. Have fun with that curve. let us all know whey your earpiece stops working and you have to do a soft reset everyday to fix it. ok ive had this phone since January and this phone has been gving me problems ever since. I live in New Jersey. Do you think if i go to the Verizon store they will let me pick out any phone of my choice? I had this issue before. I went thru 3 glydes, and I called Customer Service and told them I still wanted a touch screen device, and remembered at launch that the glyde and the voyager were the same price. So I got a titanium voyager (JUST came out, so I got brand new in box ;-) ). BTW I am in-between Baltimore, and Washington, DC. YAY as an employee all i can say IS ABOUT DAMN TIME I had to talk so many kids out of that phone it was ridiculous!!! So as an employee, how many people have you had to talk out of the XV6800? I'm on my 5th one now...1 had a bad camera, the other three bricked during the WM 6.1 update process...the phone would turn itself off during the procedure and never recover. i try to talk people out of the glyde, xv6800, enV2, and the motorola krave all the time but people still insist on buying them. then they come back and complain that we sold them a piece of crap phone even though they picked i. just like the lg chocolate. Way to stereotype. The Glyde is junk, I hope they pull it in the south also. If you think the Voyager is junk, I would dare say you are an *phone fanboy. I'm not going to say it though. And what network would your diamond happen to be on? Who's left, sprint/Metro/alltel/TMobile, unless of course out of the US. All of those are nowhere near what VZW or AT&T have nationwide. The diamond is really not that bad of a pda, to put it next to a voyager is like putting a benz next to a camry each great in class but totally different products. If you had a bad experience with the voyager that makes you a rare case, as a universal tech I can say the voyager actually isnt bad no matter what the network (VZW Telus Bell yadda yadda.). Sure it doesnt have winMO or super customizability or an htc logo but once again, two totally different products.